7 Aug 2018 Washington, D.C. The video, along with audio of her saying she is not a “Trumpkin,” a derisive term she and Never Trump leader Charlie Sykes use to describe supporters of the president, was part of a series of pieces exposing Vukmir’s opposition to the president and his agenda. In addition, another story from Breitbart News uncovered that the four senior-most staffers of her campaign–her campaign manager and directors of communication, finance, and field operations, as well as a fifth senior finance staffer–are devout Never Trumpers. This includes one who mocked supporters of the president as “Trumpkins,” like Vukmir did, with a literal photograph on social media of a pumpkin wearing an iconic Trumpian “Make America Great Again” hat. The video, in addition to showing Vukmir bashing Trump as “offensive to everyone,” including men, women, “little people,” and “fat people,” it shows Vukmir reaching out and holding her nose to act out what it would be like to vote for Donald Trump in November against Democrat Hillary Rodham Clinton. Now, per a GOP firm that has polled the issue in Wisconsin over two days and provided that data to Breitbart News exclusively on condition of anonymity, voters are turning away from Vukmir in droves the more they learn about this. A whopping 54 percent of those surveyed said they were less likely to back Vukmir when they learned about her anti-Trump comments. Only 25 percent said they were more likely to back her, and 21 percent said it made no difference. In describing Donald Trump, Leah Vukmir said: “He’s offensive to women. He’s offensive to men. He’s offensive to little people. He’s offensive to fat people. He’s offensive to everyone.” She also held her nose when describing how she would consider voting for Donald Trump. Knowing this, are you more likely or less likely to vote for Leah Vukmir in the Republican primary election for the United States Senate? While the statewide numbers are bad enough for Vukmir, getting outside of Wisconsin’s First U.S. Congressional District–where Speaker Paul Ryan, a supporter of hers represents; her state Senate seat is based; and another supporter, former White House chief of staff Reince Priebus hails from–gets even worse for Vukmir. The polling shows that in Green Bay or Madison, 61 percent are less likely to support Vukmir upon learning of her attacks on Trump, and in La Crosse, 69 percent are less likely to back her. In Wausau, 72 percent are less likely to back Vukmir, and in Milwaukee, there is a plurality less likely to support Vukmir upon learning this. The poll was run on the evenings of August 5 and August 6 and has a sample size of 1,933 likely GOP primary voters, with a margin of error of 2.2 percent. 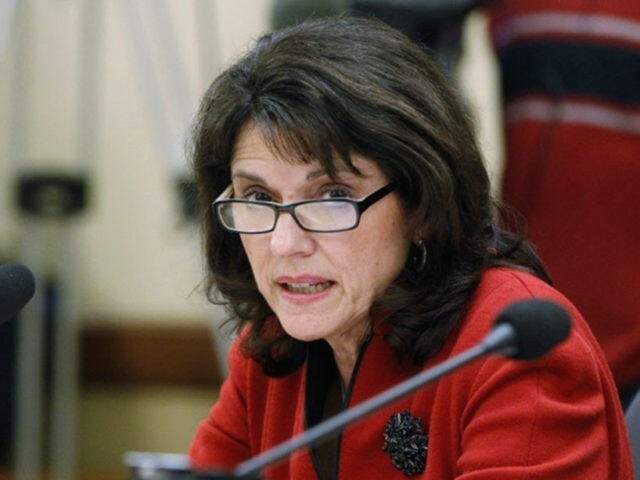 Following other attacks against her, the conservative website on Tuesday posted a video from March 2016 in which Vukmir said Donald Trump was “offensive to everyone” and indicated that many Republicans would have to hold their noses to vote for him for president. The video release came just one day after Breitbart had a story saying three members of Vukmir’s campaign team expressed anti-Trump views during the 2016 campaign. Sykes, the leader of Never Trump in Wisconsin, did an interview with the local news after Breitbart News’s expose on the Vukmir video, saying he remembered well the comments she made and found it “jarring” that Vukmir claims today to be pro-Trump when she was clearly against the president back then. Vukmir herself, and her campaign as a whole, have at best bungled their response to this whole controversy over the video. At first, Vukmir inaccurately claimed she was always supportive of Trump; she was not. She was originally a backer of Wisconsin Gov. Scott Walker, then Sen. Marco Rubio (R-FL), and then voted for Sen. Ted Cruz (R-TX) in the GOP primary in Wisconsin–the last stand in 2016 for the Never Trump movement. Trump would go on after losing that Wisconsin primary to Cruz to win up and down the Acela Corridor, then in New York, and then wrap it up in Indiana, where he officially became the presumptive GOP nominee after the contentious GOP primaries. While Nicholson backed Rubio originally, something Vukmir has pointed to in her responses to this controversy, Nicholson voted for Trump in Wisconsin’s primary and was a supporter of his ever since Rubio dropped out. Desperate DC special interests are spending millions spreading what real Wisconsin conservatives like @Duffy4Wisconsin know is fake news. Then, also published on Tuesday morning in another feature piece from the Journal Sentinel’s Glauber with an interview with Vukmir offering yet another explanation for the video: now, she is accusing Nicholson of using “swamp campaign strategy” to tank her campaign with videos of comments she made in the past. “These are desperate tactics from a guy who claims to be on the outside yet he is using D.C. swamp campaign strategy plain and simple,” Vukmir said, incredulously blaming her opponent for her own actions. Reince Priebus on WISN, reacting to attacks on Leah Vukmir: In politics, it is hard to know if someone 'is who they say they are'. Vukmir has proven she's a conservative numerous times. Kevin Nicholson hasn't. With one week to go until the Tuesday, August 14, primary, polling has been all over the place. Most polls have had the pro-Trump Nicholson leading Vukmir solidly, in many cases by double digits, but some polls have been tighter, showing either a tie or a slight Vukmir lead inside the margin of error. The latest survey, an Emerson poll, had them tied at 35 percent. Before that, an NBC poll had Nicholon up ten points at 38 percent to Vukmir’s 28 percent. Before that, a Marquette poll had Vukmir up two–leading Nicholson’s 32 percent with 34 percent, while two previous Marquette polls had Nicholson leading by five points and nine points, respectively. The winner between Vukmir and Nicholson will go on to face Democrat Sen. Tammy Baldwin (D-WI) in November’s general election in a state President Trump flipped from Democrat control for the first time in decades in 2016 against Clinton. Nicholson, per recent polling from NBC and from Emerson, fares better than Vukmir in the general election matchup. The NBC survey has Nicholson starting two percent better than Vukmir against Baldwin, and the Emerson poll has Nicholson starting five percent better than Vukmir against Baldwin. While the general election will be an uphill climb, the state of Wisconsin, even before 2016, has been trending in the GOP’s direction with Trump’s victory, Gov. Scott Walker’s multiple wins, and the win of Sen. Ron Johnson (R-WI), who won re-election in 2016 thanks in large part to coattails from Trump.